"His Mercy Endureth for Ever." The name given in the Talmud and in rabbinical writings to Ps. cxiii.-cxviii. considered as a single composition, which they undoubtedly are. They are more distinctively known as the "Hallel of Egypt," as distinguished from Ps. cxxxvi., the "Great Hallel," and from Ps. cxlvi.-cxlviii. (in a baraita apparently designated as a kind of Hallel: Shab. 118b). These psalms were evidently written to be sung publicly on some day of thanksgiving, as appears from the verse: "This is the day which the Lord hath made; we will rejoice and be glad in it" (Ps. cxviii. 24). The Aramaic word "tagmulohi" would seem to indicate a late date; the thrice-repeated cry "I shall cut them down," with "the Lord hath chastened me sore," points to a bloody war, at first unsuccessful; the words "open to me the gates of righteousness" point to the recovery of the Temple: all these together make it probable that the "Hallel" psalms were written for the Feast of Ḥanukkah, during which they are still recited every morning. Hallel is also recited on the night of the Passover as part of the family service, as it was in the days of the Temple (Pes. x. 4); on the first day of the Feast of Unleavened Bread; on Pentecost; and on the Feast of Booths (see Suk. iv. 1). Of course, where the festival days are doubled, one night and three days are added (Ta'an. 28b), making (aside from the nights) twenty-one days on which Hallel is deemed obligatory. But a Palestinian of the first generation after the Mishnah speaks (Ber. 14a) of certain days on which the entire Hallel is not recited, and on which the recital is of lesser sanctity. These days are: (1) the days of Unleavened Bread after the first, or first and second; (2) all New-Moon days other than the New Moon of Tishri, which is kept as the Day of Memorial. On these days Ps. cxv. 1-11 and cxviii. 1-11 are omitted to show the later rise and the lesser sanctity of the custom of saying Hallel upon them. The early sages boldly undertook to give this custom the force of Scriptural command by prefixing the benediction, "Blessed . . . who has sanctified us by His commandments and commanded us to read the Hallel." 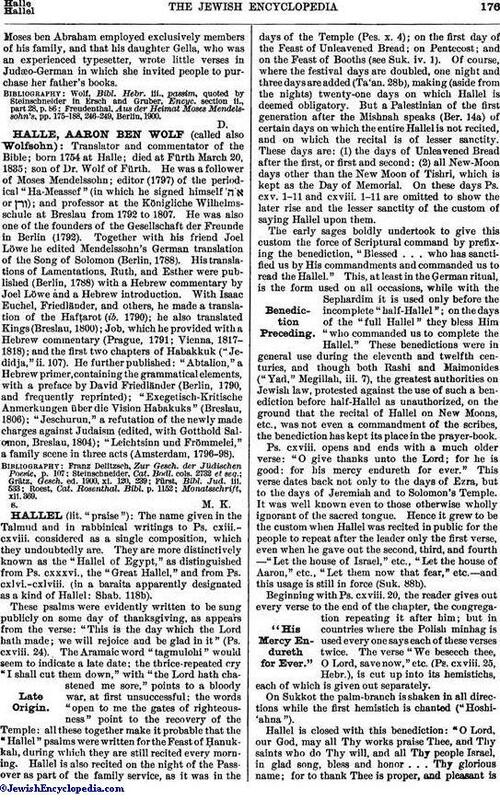 This, at least in the German ritual, is the form used on all occasions, while with the Sephardim it is used only before the incomplete "half Hallel"; on the days of the "full Hallel" they bless Him "who commanded us to complete the Hallel." These benedictions were in general use during the eleventh and twelfth centuries, and though both Rashi and Maimonides ("Yad," Megillah, iii. 7), the greatest authorities on Jewish law, protested against the use of such a benediction before half-Hallel as unauthorized, on the ground that the recital of Hallel on New Moons, etc., was not even a commandment of the scribes, the benediction has kept its place in the prayer-book. Ps. cxviii. opens and ends with a much older verse: "O give thanks unto the Lord; for he is good: for his mercy endureth for ever." This verse dates back not only to the days of Ezra, but to the days of Jeremiah and to Solomon's Temple. It was well known even to those otherwise wholly ignorant of the sacred tongue. Hence it grew to be the custom when Hallel was recited in public for the people to repeat after the leader only the first verse, even when he gave out the second, third, and fourth—"Let the house of Israel," etc., "Let the house of Aaron," etc., "Let them now that fear," etc—and this usage is still in force (Suk. 88b). Beginning with Ps. cxviii. 20, the reader gives out every verse to the end of the chapter, the congregation repeating it after him; but in countries where the Polish minhag is used every one says each of these verses twice. The verse "We beseech thee, O Lord, save now," etc. (Ps. cxviii. 25, Hebr. ), is cut up into its hemistichs, each of which is given out separately. On Sukkot the palm-branch is shaken in all directions while the first hemistich is chanted ("Hoshiahna"). Hallel is closed with this benediction: "O Lord, our God, may all Thy works praise Thee, and Thy saints who do Thy will, and all Thy people Israel, in glad song, bless and honor . . . Thy glorious name; for to thank Thee is proper, and pleasant isit to play melodies to Thy glorious name, for from everlasting to everlasting Thou art God: Blessed be Thou, O Lord, the King praised in hymns!" For the Hallel in the Passover night service see Haggadah. Caro, Shulḥan 'Aruk, Oraḥ Ḥayyim, 422, 488, 683. A. L. N. D.Musical Setting. All trace is lost of the chants to which the Hallel was intoned before a comparatively modern date. In consequence there is no general tradition: every composer of synagogue music offers his own setting. In the medieval period the folk-song of the day was reproduced in the Hallel, where the contemporary expression of joyousness always supplanted the older cantillatory intonations, as Ps. cxvii. and cxviii., at least, were approached. Many such melodies, often of marked beauty, have been preserved in the synagogues of the Sephardic ritual. A rich store of them will be found in the collections of De Sola and Aguilar ("Ancient Melodies of the Liturgy of the Spanish and Portuguese Jews"), and Consolo ("Libro dei Canti d'Israel"). Typical, and of particular interest because of their use in many Ashkenazic and Reform synagogues, are the two well contrasted old melodies here presented (comp. De Sola and Aguilar, "Ancient Melodies," Nos. 42, 43; Salaman and Verrinder, "Music of the West London Synagogue of British Jews," i.; Cohen and Davis, "Voice of Prayer and Praise," Nos. 62, 63; Pauer and Cohen, "Traditional Hebrew Melodies," No. 12). The first of these is wide-spread among the northern Jews as a tune for table-hymns (see Zemirot). 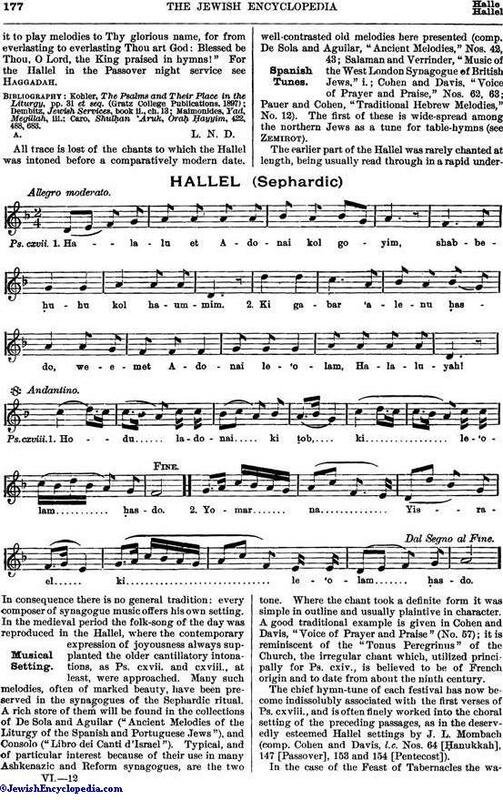 The earlier part of the Hallel was rarely chanted at length, being usually read through in a rapid undertone. Where the chant took a definite form it was simple in outline and usually plaintive in character. A good traditional example is given in Cohen and Davis, "Voice of Prayer and Praise" (No. 57); it is reminiscent of the "Tonus Peregrinus" of the Church, the irregular chant which, utilized principally for Ps. cxiv., is believed to be of French origin and to date from about the ninth century. 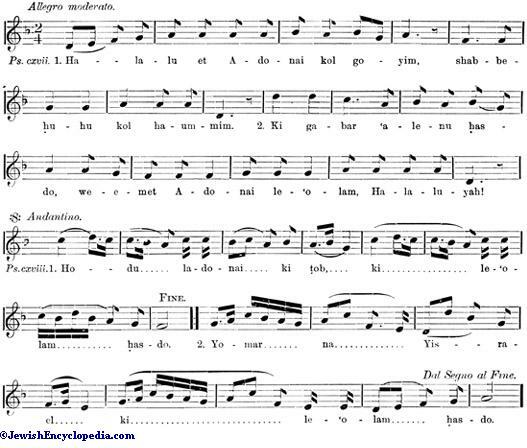 The chief hymn-tune of each festival has now become indissolubly associated with the first verses of Ps. cxviii., and is often finely worked into the choral setting of the preceding passages, as in the deservedly esteemed Hallel settings by J. L. Mombach (comp. Cohen and Davis, l.c. Nos. 64 [Ḥanukkah], 147 [Passover], 153 and 154 [Pentecost]). New Moon (no general tradition). Feast of Dedication (Ma'oz Ẓur). Festival of Passover (Addir. Hu). Festival of Tabernacles (lulab chant). The last has been handed down in two forms, a major and a minor, and exhibits traces of the intervals smaller than a semitone, which, with its mystical character, resulting from unenunciated vocalization between the syllables of the text, seem to point back to an original framework derived from the Orient. In most incongruous juxtaposition, several poor, jingling tunes are, in the North-German tradition, often associated with the majestic old theme (comp. Marksohn and Wolf, "Auswahl Alter Hebräischen Synagogal-Melodien," No. 3, and note; Baer, "Ba'al Tefillah," No. 816a, b, c, d). In the theme itself may be detected analogies with an old Provençal strain utilized by Bizet in his music to "L'Arlésienne," and with the melodies quoted in Jew. Encyc. s.v. Ashre ha-'Am and Geshem. 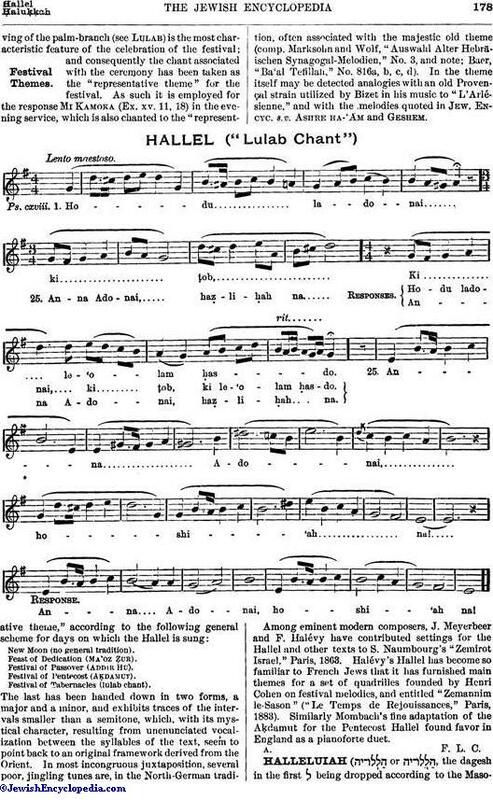 Among eminent modern composers, J. Meyerbeer and F. Halévy have contributed settings for the Hallel and other texts to S. Naumbourg's "Zemirot Israel," Paris, 1863. 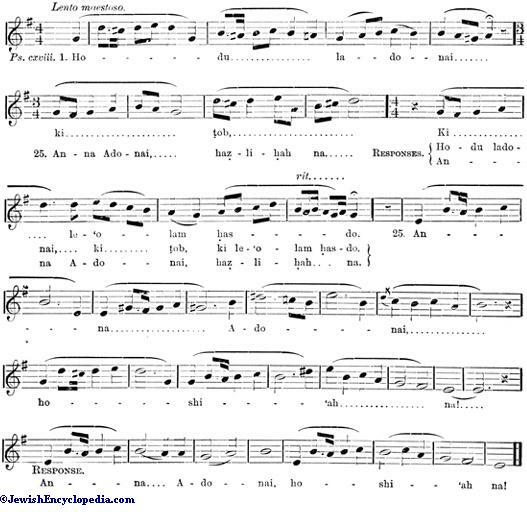 Halévy's Hallel has become so familiar to French Jews that it has furnished main themes for a set of quadrilles founded by Henri Cohen on festival melodies, and entitled "Zemannim le-Sason" ("Le Temps de Rejouissances," Paris, 1883). Similarly Mombach's fine adaptation of the Aḳdamut for the Pentecost Hallel found favor in England as a pianoforte duet.